09 | November | 2008 | can i just finish my waffle? President-elect Barack Obama has named John Podesta, Valerie Jarrett, and Pete Rouse co-chairs of his transition team. He has also named William Daley, Carol Browner, Federico Pena, and Janet Napolitano to his advisory panel. Illinois Rep. Rahm Emanuel has accepted the job of White House chief of staff. John Podesta – From Chicago. Chief of Staff under Bill Clinton. Federico Pena – Mayor of Denver, Colorado House of Representatives. Headed US-DOT under Clinton, Secretary of Energy under Clinton (Bill Richardson followed him). William Daley – From Chicago. Brother of Chicago Mayor, Richard Daley. Secretary of Commerce under Bill Clinton. Manager of Al Gore’s 2000 presidential bid. Carol Browner – Undergraduate and law degree from University of Florida. Head of Florida Department of Environment Protection. Administrator of EPA under Clinton. Janet Napolitano – Born in NYC. Governor of Arizona. This is just some quick facts. Maybe more later. Sarah Palin will sit down for her first post-election interview with FOX News Channel’s Greta Van Susteren. Van Susteren will be traveling to Alaska for an extensive interview with the state’s governor, which will air Monday at 10 p.m. ET (11.10.08) on the FOX News Channel. Fox News beat out several other networks to be the first to talk with Palin after her failed vice presidential bid, including requests by Barbara Walters, Oprah Winfrey, Larry King and others. President-elect Barack Obama has named John Podesta, Valerie Jarrett, and Pete Rouse co-chairs of his transition team. He has also named William Daley, Carol Browner, Federico Pena and Janet Napolitano to his advisory panel. Illinois Rep. Rahm Emanuel has been offered the job of White House chief of staff. Jarrett has been close to both Barack Obama and Michelle Obama for years and is now co-chairwoman of his transition team. It is fair, I think, to say that her record shows much about both Obamas, since the three have been allies for so long. Jarrett worked briefly as a lawyer for Mayor Harold Washington, and stayed on after his death to become Mayor Richard Daley’s Deputy Chief of Staff. In other words, she was a key cog in the Daley machine. 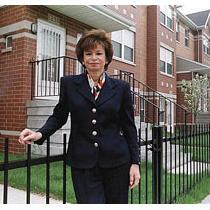 She is also a businesswoman, CEO of the Habitat company, which manages housing in Chicago, not always successfully. The Boston Globe did a very substantial investigation of the problems in some of the housing that she, and other allies of Obama, managed. You should read their whole exposé, and even watch the video that accompanies it. Appeared on Meet the Press 11.09.08. To quote Ms. Jarrett: [Obama is] “ready to take power and begin to rule, day one.” Interesting choice of words.